Check Out the Carving Videos! Now available in DVD Format! Designing and carving thousands of pieces in his 30 plus years of experience, Stu has his completed works of art in many prominent locations. In addition to teaching 15-20 seminars per year across the country, he works through his agent to produce works of art for numerous shops and galleries throughout the Western United States. "Visions of the American West"
collection of roughouts is only the latest of this effort. In addition, check out his new Santa Claus roughouts. Stu Martin carries a large selection of quality northerm Basswood roughouts including Native American Indian roughouts, Mountain men roughtout and Santa roughouts. Each rough out is of the finest northern basswood and comes with multi-view pictures to aid the carver in working with the roughout. In addition, the western pieces include proven finishing instructions. the quality of our roughouts. that are available from Stu, check out the Order Information page. Copyright Notice: This web site is fully and completely protected by International Copyright law. All images, articles and content are fully Copyrighted and my not be reproduced, copied, used in any manner what so ever, nor appear or be used on any web site without the express written consent of the Stu Martin. 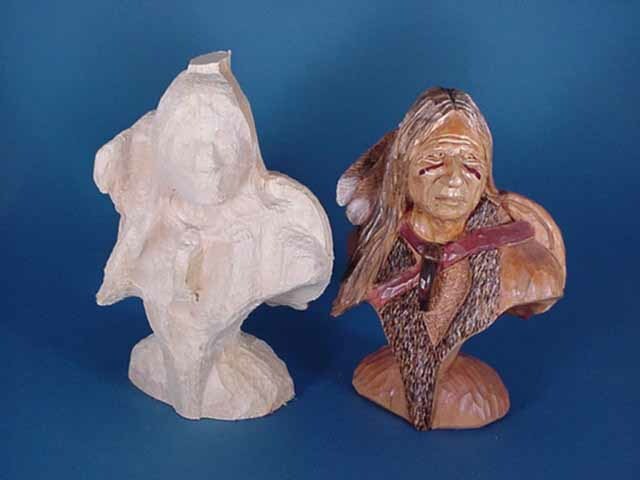 Stu Martin Roughouts: We supply quality wood carving Rougouts, such as Santa, Mountain men, Native American Indians and much more. Check out the Visions of the American West series.